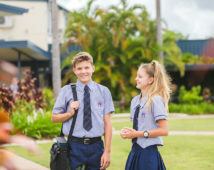 Emmaus College provides a unique educational opportunity for your child, boasting dedicated Middle and Senior School campuses equipped to meet the needs of students of all ages. The Yaamba Road campus is home to students in Years 7, 8 and 9 with the Main Street campus serving students in Years 10, 11 and 12. First class educational facilities with the latest technology and modern responsive learning spaces. You can read more about the offerings of each campus below. 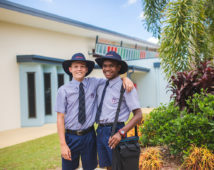 Students in Years 7, 8 and 9 are encouraged to take pride in their school and themselves on the Yaamba Road campus. Our priority on this campus is to ensure students are making a positive transition into the high school environment. We want them to establish and maintain healthy relationships, employ helpful thinking and be mindful of their own mental, physical and spiritual wellbeing. There are many structures in place that we use to help students develop and feel comfortable within their school environment. Year-level specific eating areas and the Tutorial group are important to the growth and wellbeing of all students in the Middle School. Opportunities for students to engage in leadership and student advocacy activities exist in the Middle School. Student Councils are elected for each Year level to work in tandem with teachers and campus staff to work towards meeting the unique needs of these students. Student Councils and various other committees are also afforded opportunities to organise key school events such as liturgies, assemblies, retreat days and the Middle School Dance. 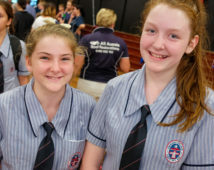 Our Middle School students also have opportunities to participate in over 20 interschool sports throughout the year; the Instrumental Music Program, which caters for first-time instrumentalists through to advanced musicians; numerous community service initiatives as well as opportunities to be a part of the annual musical production. Students can also participate in a number of special interest groups such as Reader’s and Writer’s Group and the information technology-focussed Coding Club. a range of outdoor lunchtime activities such as table tennis, Giant Chess and Giant Connect 4. 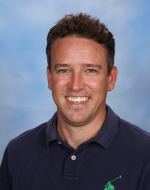 The Middle School aims to instill clear standards into students. Middle School staff insist on the highest standards of work and behaviour in the classroom and in the playground. We expect students to be punctual, to be adequately equipped with all materials for their classes; and at all times we expect that they wear the uniform neatly properly and proudly. The Responsible Thinking Process is employed consistently and effectively on Yaamba Road. Students are expected to respect the rights of the teacher to teach and the rights of their fellow students to learn. The Planning Room on this campus is a facility to help students who choose not to follow these expectations reconfigure their outlook towards their peers’ and their own learning. We look forward to welcoming your child to the Middle School campus. Our Year 10, 11 and 12 students are afforded increased independence and treated like young adults on the Main Street campus. Increased privileges such as driving to school and home study during examinations reinforce the ideology that our Senior students are capable, mature, self-directed citizens, ready to take on the responsibility that comes with growing up and life after school. They are prepared for the real-life expectations associated with employment, further study and engaging with life. Students have access to specialised academic support in the form of tutes for a range of subjects such as Chemistry, Physics, Mathematics and Information Technology and Design. Throughout their Senior years at Emmaus, students are encouraged to explore their potential by trying new things; to develop their skills in time management and leadership; and to manage the balance between academic, social, family and other commitments. 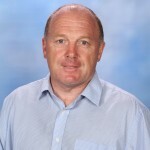 Additionally they are also encouraged to participate in a wide range of opportunities where they can share these skills with younger students and the wider community. Students can be involved as members of the Student Council; can be elected as one of six Leaders for each of the College’s sporting houses; and contribute to the improvement of their campus experience as part of the Liturgy, Interact, Academic or Campus Activities committees. Students have access to a wide variety of work experience opportunities to complement their academic pursuits. Work experience opportunities range from ongoing, regular contact with an employer through to week-long group programs aimed at students interested in particular occupations or study disciplines. 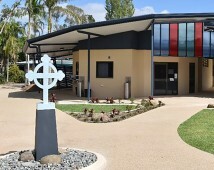 The Main Street campus shares a boundary with local aged care facility Leinster Place. Emmaus shares an active and ongoing relationship with the facility and its residents. Our Eco Group visits fortnightly during term to undertake numerous gardening and sustainability projects,; and our Interact Committee runs activities for residents on significant religious and other occasions. Positivity – feeling safe, a sense of belonging, interest, contentment and cheerfulness as well as a capacity for mindfulness and optimistic thinking. Relationships – experiencing ongoing positive relationships with peers and teachers to develop prosocial values and social skills. Outcomes – making progress towards goals, feeling capable of doing schoolwork and understanding that accomplishment depends on hard work, effort and persistence. Strengths – involves self-knowledge about one’s character strengths and ability strengths as well as the understanding of how to apply these strengths in different contexts. Purpose – believing that what one is learning at school is valuable and feeling connected to something greater than oneself. Resilience – the capacity to ‘bounce back’ after setbacks, mistakes and difficulties, and being courageous in the face of challenge. The Responsible Thinking Process is employed on this campus also, however places more emphasis on the student resolving any issues that may inhibit learning. We look forward to continuing with your child’s Emmaus journey on the Main Street Senior School campus.